For anyone who’s interested in the history of Toronto and its neighbourhoods, I recommend A Toronto Album, Volume 2 by Mike Filey. It has over 100 historical photographs, details of the history of our subway system, how transit has evolved over the past century and what happened to many buildings in the 1960s that were of historical significance, including the infamous Casino theatre, which was torn down in 1965 to make room for the Sheraton hotel. There is also some fascinating trivia. For instance, did you know that Simpsons made deliveries by horse until the mid 1940s? 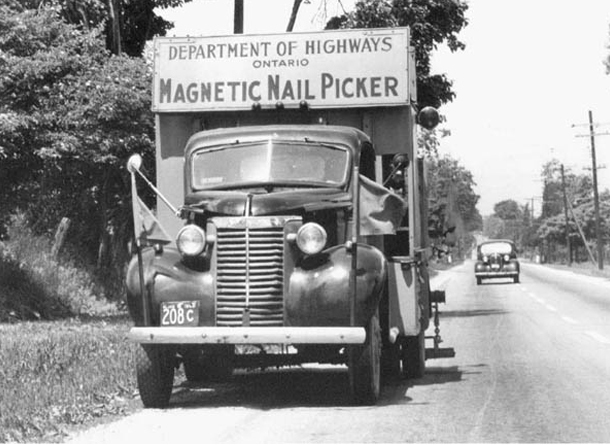 Or that to preserve rubber tires during World War II there was a truck with a giant magnet that roamed the streets picking up nails? The book was originally published in 2002, which means that some of the information is a little outdated as there are dozens of new buildings erected in the past 13 years. It’s still a fascinating read. Toronto Album, Volume 2 is available as both an ebook from the Toronto Public Library and in hard copy. Mike Filey has published over a dozen books on the history of Toronto, including the TTC Story, Mount Pleasant Cemetery and 11 ‘Toronto Sketches’ books.